TECHNOLOGY : 3G: What's That? As the Jadoo (magic) of 3G begins to seep into the country, Indian folks will finally get to utilize those fancy-schmancy features on their so called smart phones, sooner or later. 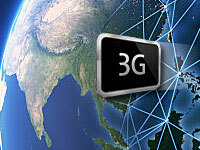 Surely, many of you have burning questions about 3G and everything related to it. So, read on; a few common 3G-related questions have been answered to demystify it for you. 3G, or 3rd generation mobile telephony, is the generic name for the next generation of mobile networks that will combine wireless mobile technology with high data rate transmission capabilities. What you've been using until now is 2G/2.5G (2nd generation mobile telephony), which offers speeds between 64-144kbps. With the availability of 3G in India, users will be able to enjoy speeds of 144kbps-2mbps on their mobile phones. What can 3G offer you? Simply put, 3G will offer mobile phone users faster Internet speeds. This, in turn, will provide mobile users with higher data transfer rates, with support for a variety of services such as high-resolution video streaming, mobile TV, high-speed interactive gaming, and other multi-media features, in addition to voice, fax, and conventional data services. If you are an avid surfer of the Internet on your mobile phone with the current 2.5G connection, you must have experienced the irritants of slow browsing speeds and video lag. With 3G, Web pages will load faster, there will be little or no video lagging, and downloads will be faster too! Utilizing the full potential of 3G, you can turn the mobile phone into a device that bundles infotainment and electronic commerce (e-commerce) services together. When will you be able to use 3G services? The state-owned telecom operators have already begun to soft-launch 3G services in the metros. The services (for trial) have already commenced in Delhi, with Chennai and Mumbai in line. The commercial launch will happen in a couple of months' time - this is when users will be able to subscribe to the data plan(s) offered by the telecom operators. BSNL has said that it will offer 3G services across the country by mid-2009. Post mid-2009, we will see private players jumping into the 3G bandwagon. This is when competition will set sail and 3G-penetration across India will really start to materialize. How much will 3G services cost? No tariff has been declared by MTNL for its 3G Jadoo services, which was rolled-out yesterday; neither has any governing body given out specifics for the same. J. Gopalan, MTNL's (Mumbai) executive director, had said that 3G services will be affordable for the common man . We'll soon learn whether this is true when the 3G services are commercially launched. However, rest assured that 3G services are going to cost you more than what you pay for your GPRS connection. Post the spectrum auctions, depending on the price the private telecom operators are willing to pay to be able to offer 3G services, the tariff scenario will heat up. How much will 3G-capable phones cost? Currently, 3G-capable phones available in India cost anywhere between Rs. 7000 to 50,000 (approximately most phones in the upper price range category are 3G capable).